The holiday season is almost upon us, and so the biggest players in the tablet market finally have their latest flagships already available. The iPad Air, from Apple, and the Transformer Pad TF701T, from ASUS, are some of the most interesting tablet flagships this holiday season. Both of them have very high-end specs, including high-resolution displays and very powerful processors, along with a high price tag. But which one is worth your money the most? The iPad and Transformer lines of tablets have had the most distinguished tablet designs for a long time, and the trend continues with the TF701T and the iPad Air. Unfortunately though, the TF701T has fallen behind the competition in terms of size and weight. While 2013 has ushered in a new trend of thinner and lighter tablets with narrower bezels, the Transformer tablet is still about as thin as light as its predecessors, and the bezel continues to be as wide as it can get. Of course, the unchanged bezel width is a design choice, rather than a technological incapacity to reduce it, and it at least brings the benefit of having lots of room where you can rest your thumbs without them touching the screen. The Transformer Pad is noticeably thicker than the iPad Air (8.9mm vs 7.5mm), but the Transformer Pad isn't exactly thick either, as it's at least slightly thinner than last year's iPad 4. The TF701T is also much heavier, weighing 585g, versus the iPad Air's 469g. Again, that doesn't mean that the TF701T is too heavy, and it's significantly lighter than the iPad 4, but it's undeniable that the iPad Air's lighter body makes it less tiring to hold and use for extended periods of time compared to the Transformer Pad. The Transformer Pad and the iPad Air are among the few tablets that have an aluminium construction, so they're on the same page in terms of the quality of its materials. The iPad Air, adopting the same design as the iPad mini, has an aluminium back, available in two colors: 'Space' gray and silver. The Transformer Pad also has a gray-colored aluminium back, but with a finish of concentric circles, a signature ASUS design. Like the LTE version of the iPad Air, the Transformer Pad has a plastic RF strip on the top. The iPad Air and the ASUS Transformer Pad have some of the best displays ever seen on a tablet. Both have extremely high resolutions, both get pretty bright and colors look vivid on both. The iPad Air has the usual 9.7" IPS display, and has a resolution of 2048 x 1536, resulting in a pixel density of 264ppi, so as expected text is razor sharp. The IPS technology also ensures a near 178-degree viewing angle and bright colors. The 4:3 aspect ratio of the display is very good for reading and web browsing, but isn't so great for watching videos because the 16:9 aspect ratio of most movies and videos result in a lot of letterboxing in the iPad's 4:3 screen. The Transformer Pad has a 10.1" IPS display with power-efficient IGZO technology manufactured by Sharp, with a 2560 x 1600 resolution. This resolution gives the tablet a 299ppi pixel density. 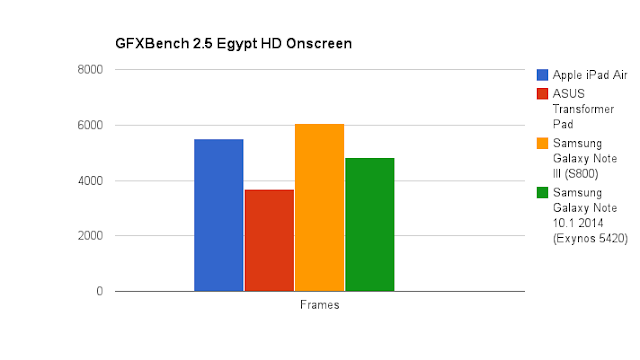 While you may think that 299ppi is much sharper than 264ppi, the difference in sharpness between the two screens is barely noticeable, at least at normal viewing distances. Much like the iPad Air, the TF701T's use of IPS display technology gives it wide viewing angles and nicely saturated colors. The 16:10 aspect ratio of the Transformer Pad's screen is great for watching movies, but it makes use in portrait mode a bit awkward. And let's not forget about what gives the Transformer Pad its name. While the iPad Air is almost definitely a device geared towards entertainment rather than productivity, the Transformer Pad goes the other way. That's because the Transformer Pad is actually a hybrid tablet/notebook. The optional keyboard dock that ASUS sells for about $149 attaches to the tablet via the dock connector at the bottom and turns the Transformer Pad into a sort of 10.1in Android notebook. The presence of a physical keyboard obviously makes writing documents a lot easier than using onscreen keyboards, and the device's small footprint makes it very portable, so if you're into writing documents while on the go, the Transformer Pad is perfect for you. The keyboard itself isn't very different from previous iterations. This time around it's made of plastic, unlike the aluminum-built tablet. The dock doesn't look super sturdy, but I don't expect it to break very easily, however, when docked the tablet has a bit too much space to wobble, which is a bit of a concern to me. In fact, I've been seeing many complaints that some of the first units manufactured had some problems with the tablet-to-dock connection, so be aware of that. Other changes include a USB 3.0 port (up from USB 2.0 in the last generation). The keyboard dock also features a 16Wh battery that charges the tablet's battery when docked, giving it a little extra juice on a single charge. As flagship tablets, both the iPad Air and the Transformer Pad feature top of the line processors. The iPad Air is powered by an Apple A7 processor, while the Transformer Pad sports an NVIDIA Tegra 4 SoC. The Apple A7 is a remarkable processor, in the sense that it's CPU core, dubbed Cyclone, is the first to be based on the ARMv8 architecture, which also happens to be the first mobile 64-bit architecture. While the main advantage of 64-bit is support for more than 4GB of RAM, an advantage that won't be useful for iOS devices for a long time, since they're still on 1GB, the 64-bit architecture also boosts the CPU's performance because it can handle much larger memory addresses than conventional 32-bit CPUs. That alone boosts single-threaded performance significantly. Not only that, but Apple's Cyclone core is also much wider than its predecessor, the Swift. In fact, it's the widest mobile CPU architecture ever seen so far. The wider machine plus the 64-bit architecture boost single-threaded performance ahead of all of its competitors. With so much power on a single core, the A7 needs only two of these Cyclone cores clocked at 1.4GHz to be competitive with the latest quad-cores. 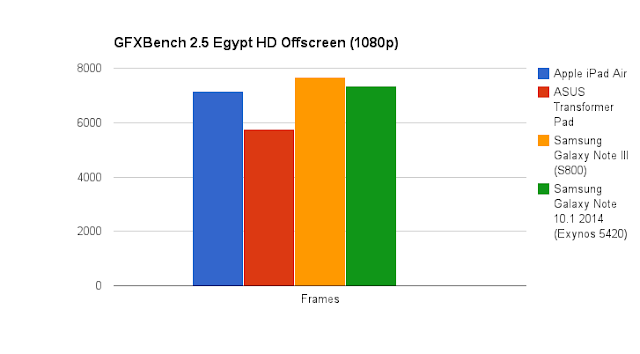 The Tegra 4's CPU is a bit more mundane than the A7's, but it still performs admirably well. It has four Cortex-A15 cores clocked at 1.9GHz, plus a shadow A15 core that can go all the way to 825MHz. This is the same 4-PLUS-1 architecture seen on last year's Tegra 3, and is quite similar in function to ARM's big.LITTLE technology. Basically, in situations where the performance demand from the CPU is low, for example, when your device is locked or idling, the quad-core A15 is power gated and all processing is transfered to the shadow A15, which consumes much less power than the other A15 cores. When the demand on the CPU increases beyond the shadow A15's capabilities, the processing transfers back to the quad-core A15 seamlessly. The only function of this architecture is to increase battery life. 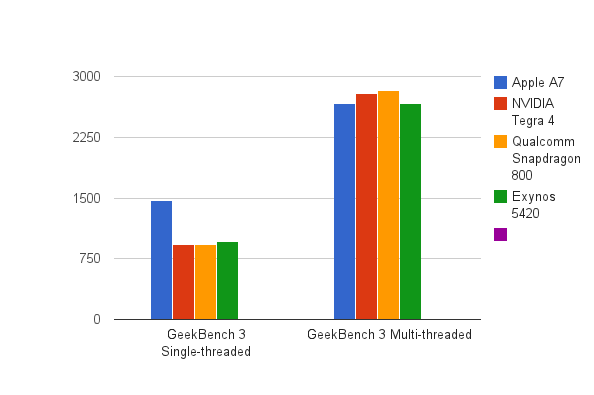 Looking at the GeekBench 3 results for the Apple A7 and the Tegra 4, it's clear that the A7 is much ahead of its competition in single-threaded performance. However, moving to multi-threaded applications, the A7 has the disadvantage of having less cores than its competitors, but it can still achieve a score close to its quad-core competitors. In theory, the Apple A7 really is on par with the Tegra 4 and the other high-end SoCs, but the A7 may have the upper hand due to its strong single-threaded performance. Mobile OSes and most of the applications available for them usually rely more on single-threaded performance, so in this sense the A7 may turn out to be faster for most uses than its competitors. However, having more cores = more threads, so the A7's quad-core competitors may be better for multitasking, something that OEMs have been craving to perfect on tablets. But as far as theory goes, the Apple A7 is just as good as the Tegra 4. Moving on to the GPU, the A7 continues Apple's tradition of licensing GPUs from ImgTech, and this time it's the PowerVR G6430. This is a very powerful GPU that boasts of OpenGL ES 3.0 support. As you may have imagined, the Tegra 4 features NVIDIA's own GPU core, which they like to call the 72-core ULP GeForce. Unfortunately, the Tegra 4 uses an ancient shader architecture, which is composed of discrete pixel and vertex shaders, a much more limited architecture compared to the unified shader architecture in the PowerVR G6430. 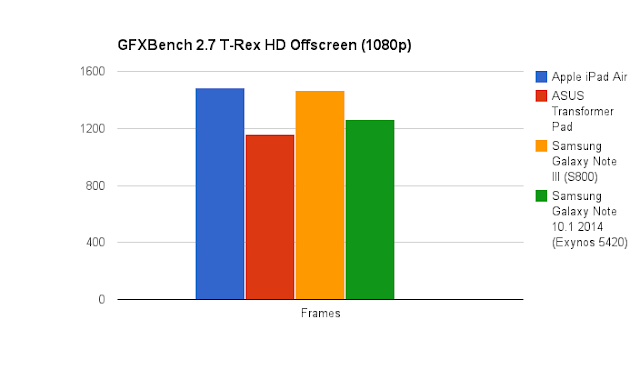 The Tegra 4 also does not support OpenGL ES 3.0, and only goes as far as OpenGL ES 2.0. For now, this is not a problem as there aren't any games that require OpenGL ES 3.0, but in a year or two it may be. To see how these two tablets compete in terms of GPU performance we turn to GFXBench. Note that the first two tests are rendered offscreen at a fixed 1080p resolution, so the Transformer Pad's higher resolution doesn't penalize it there. While the iPad Air reigns supreme in the T-Rex HD Offscreen test, the Transformer Pad is left as the slowest flagship tablet this holiday season. The difference in framerate between the two tablets isn't enormous, but it's still a very tangible difference. Once again, there is quite a gap between the Transformer Pad and the iPad Air here. Next up are the Onscreen tests, which are run at the device's native resolution. The Transformer Pad really falters here because it has to render at a higher resolution than the iPad Air. 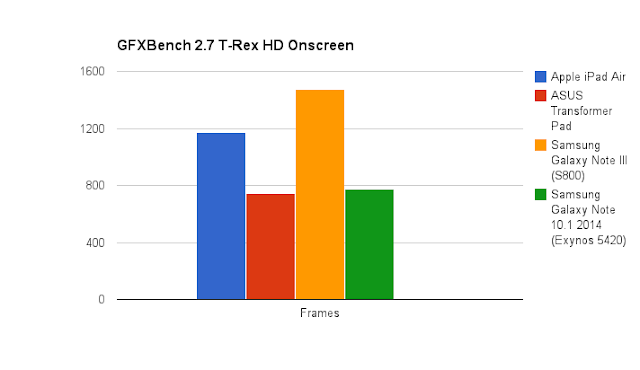 Also, the Onscreen tests are the most representative of real-world graphics performance. The Transformer Pad's higher resolution increases the gap between it and the iPad Air quite tangibly. Now the Transformer Pad is way below its main competitors, even the Galaxy Note 10.1, which has the same screen resolution. The difference in performance between the iPad Air and the Transformer Pad are pretty big here. As flagship tablets that pack a lot of punch, the iPad Air and the Transformer Pad are expected to have relatively high power consumption. The high-resolution displays themselves draw a lot of power, and when at full power the tablets' processors should be power hungry as well, however, since the processors are both based on 28nm technology it shouldn't be a huge concern. The Tegra 4's 4-PLUS-1 architecture helps the Transformer Pad last a little longer on a single charge, too. Both tablets have large batteries to sustain their power hungry systems, and on the Transformer Pad it's a 31Wh unit, slightly smaller than the iPad Air's 32.4Wh battery (So yeah, the Transformer Pad is thicker AND has a smaller battery. Come on ASUS). And the iPad Air does in fact last considerably longer on a single charge than the Transformer Pad. However, don't forget that the Transformer's keyboard dock has a 16Wh battery that can give the Transformer Pad up to 4 hours of extra usage. With the keyboard dock, the Transformer Pad can outlast the iPad Air quite easily. Many times I call a tie in these comparisons, but this time I have to say that for most uses the iPad Air is clearly the better tablet. It has a much sleeker, lighter frame, significantly better performance and even better battery life than the Transformer Pad TF701T. Of course, if you want to have a tablet on which you can be productive, then that changes everything. The iPad Air is simply not a very good device for work. Of course you can always use a third-party bluetooth keyboard with iWork apps and call the iPad productive, but ASUS' integration of the keyboard dock and the tablet/notebook convertible concept makes the Transformer offering better for productivity than any iPad + bluetooth keyboard combination. If. however, you only want a tablet for playing games, watching movies, browsing the web, etc., then the iPad Air is probably a better offering than the Transformer Pad. In truth, the Transformer Pad would've been much better had it launched a few months earlier. It's much more of a close match to the iPad 4 rather than the iPad Air, so basically the Transformer Pad is a tablet that feels one generation old. However, I can't just say that the iPad Air is superior to the Transformer Pad and leave it at that, as these two are competing at very different price points. The 32GB Transformer Pad costs $449, $150 less than the 32GB iPad Air ($599), and even the entry-level 16GB iPad Air ($499) costs $50 more. The Transformer Pad with the keyboard dock would match the price of the iPad Air at the same storage capacity, actually. Compared to other offerings in the $449 price range, the Transformer Pad fares much better, competing with the Surface 2 and the Xperia Tablet Z. So who would I recommend the ASUS Transformer Pad to? Obviously, I highly recommend it for who likes to work while on the go. If the iPad Air's $499 starting price is a bit too much for you, the Transformer Pad is generally the best tablet in the $449 range. However, if you want a tablet for entertainment rather than productivity, or if can do with bluetooth keyboards for the iPad and you can afford $499 the iPad Air is almost definitely the better tablet. Not only does the Transformer have a microSD slot on the tablet, add the keyboard and you get a full sized SD slot and a USB 3 port. iPads are fun toys (I have one) but Android Tablets, in particular the Transformer Line, are much more flexible and still give you the fun factor for entertainment.